Falstaff wrote: Possibly - or possibly not. It seems as though you said that regardless of an item's cost, if you like it and it does what you want it to do, then it is worthy of one's ownership. Or, to illustrate another way - replace "Mont Blanc" with "Rolex" (both are the pre-eminent names in their respective fields - i.e. expensive pens and expensive watches) in the coloured qoute. A view that seems to run contrary to your many statements regarding the value of Rolex. Which is why your take on this makes no sense. You understand my view on the issue, so why try to use the ambiguity in my comment to mean I must be saying the opposite of what I think? Even after I clarified that my comment was a response to Smells implication of the low cost being a negative issue in other people's perception of the pens. Ambiguity eh? I guess it could charitably be called that. And yet you, I, and Smells know that although a Montblanc is cheaper than a top line Visconti, it is far more expensive than an everyday BIC. Montblanc is the the Rolex of pens. Perhaps you didn't say what you think you did. Last edited by Falstaff on January 30th 2018, 7:44pm, edited 1 time in total. Falstaff wrote: Montblanc is the the Rolex of pens. Hadn't considered them in that way...though if you did wouldn't they be more like a Tudor? Perhaps you didn't say what you think you did. Nope, not looking for points. Just wondering why the same "overpriced for what you get" argument you've often made against Rolex wouldn't apply to Montblanc - which in my mind at least occupies the exact same territory in pens that Rolex does in watches? I can't quite see the Tudor comparison in that Tudor is more inexpensive line than Rolex whereas Montblanc, like Rolex, occupies the top spot in its manufacture. Unless of course Montblanc has introduced an ultra-luxe line (other than their limited editions) in the years since I had more than a passing interest in fine fountain pens. I guess, like Smells, I don't see Montblanc as a particularly high-end pen. I certainly wouldn't have compared them with the likes of Rolex in the watch world. And lets be clear; I don't dislike Rolex. 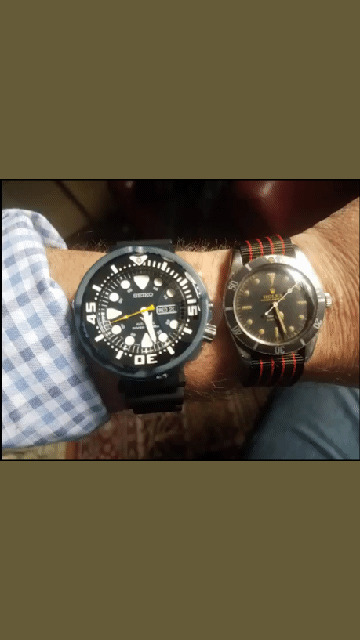 I think the Submariner line is over-priced and functionally sub-par as a dive watch. The Daytona has similar issues with price and function IMO (poor dial readability for a chrono). The Sky-Dweller is technically interesting but visually an abomination. Classics like the Datejust are great watches but not my thing. The Explorer II is fabulous. The modern Sea-Dweller gives me an erection. I do dislike the Rolex hype. I'd tend to go along with the notion that Rolex and Montblanc occupy similar places in brand awareness. Specifically both brands have extended beyond their target markets. The guy that tells time with his cell phone has heard of Rolex and the guy that does his writing with whatever ball point is chained to the desk has heard of Montblanc - in many cases they're the same guy. Once one contracts either or both of the WIS and PIS (pen idiot savant) viruses both brands gain a lot of context but only with the respective _IS. Most normal folks will see more success projected by a two-tone Sub and Montblanc than a white gold Patek Nautilus and 10K Namiki Emperor. I think the marketing folks referred to this as "brand value". Rolex and Montblanc have it in job lots. Patek and Namiki have it but only in a very narrowly focused market. Actually I'm partial to Montblanc myself. I like to use a black resin Meisterstuck Classic fountain pen with an italic nib to fill in my cellarbook, a sterling Meister with medium nib for personal correspondence and a black resin Meister Classic ball pen for lists and such - although my EDC is usually either a yellow or bordeaux Aurora Ipsilon ball pen. I like Montblanc too. I want a white one and a sterling one when I grow up over here. Also, I love Rolex. I love the SUBMARINER and Daytona and the Explorer Eye Eye (I will have one one day). I rather fancy a platinum Rolex one day.